Jake Latz hasn’t pitched a whole lot since high school. The left-hander fought through injury and illness his first two years of college, then transferred and had to sit a year. He was drafted out of Kent State in 2017 without throwing a pitch for the Golden Flashes, and pitched just 2 2/3 innings for the Texas Rangers’ Arizona League affiliate last summer. So the lefty is still refining his craft. 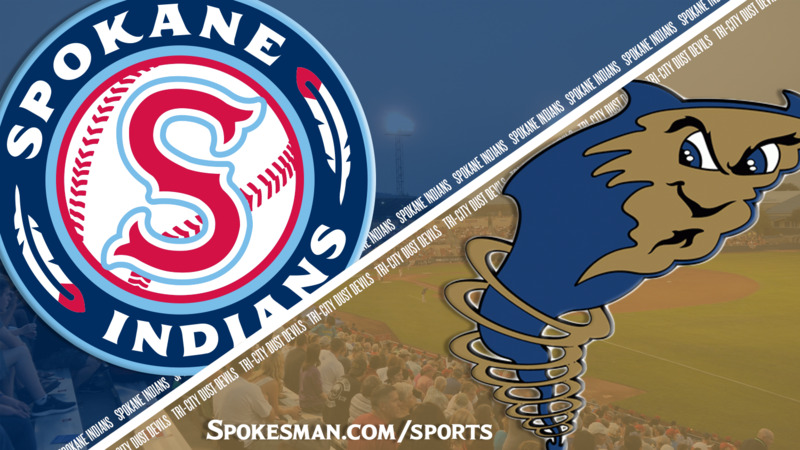 Latz rebounded from last week’s rough outing to pitch five good innings and the Spokane Indians ended a six-game losing streak, beating the Tri-City Dust Devils 5-2 in the first of a three-game Northwest League homestand on Wednesday. Spokane (7-13) has won 11 of its last 13 on the Fourth of July. Latz said it’s a relief the team won in its first game back home after the winless road trip. “It’s huge,” he said. “It starts with starting pitching like they preach on us. We just have to do our jobs and give our team a good chance to win. “It’s something about this place that we enjoy winning games,” Indians manager Kenny Holmberg said. Latz gave up six earned runs in 5 1/3 innings on June 28 against Everett. He was much better this time out. Latz allowed two runs on five hits and a walk with four strikeouts. The only runs he gave up were in the fifth, courtesy of Aldemar Burgos’ two-run homer. Holmberg liked what he saw from his starter. “He’s impressive,” Holmberg said. “He’s cool, he’s calm, he’s collected. When he gets his stuff going, it’s a good mix. The first inning set the tone of the game. Latz got two groundouts on his first two pitches. Tri-City outfielder Grant Little, the San Diego Padres’ second-round pick in this year’s MLB Draft, collected his fifth hit in his 12th professional at-bat, a line-drive single to right, but Latz came back to coax another groundout to end the first. The Indians got something going with two down in the first. Jonah McReynolds singled to left and Curtis Terry’s “excuse-me” swing bounced one through the open hole at second. McReynolds made it to third and Terry took the extra base when the ball bounced away. Tanner Gardner cashed in both runners with a looping single to center. Martinez followed by walking Austin O’Banion, which brought a visit from T-C manager Mike McCoy. Cristian Inoa beat out an infield single to load the bases. After Isaias Quiroz drew a walk to force in a run, Martinez’s day was done early. Nick Kuzia was brought in and coaxed a pop-up by ninth-place hitter Obie Ricumstrict to end the first-inning rally at 3-0. “We came out swinging, put three up in the first and kept chipping away,” Holmberg said. Michael Curry ripped a double to left-center leading off the second and Olivier Basabe’s grounder to third clanged off Tyler Depreta-Johnson into left for an error to put runners at the corners with no outs. Latz caught Mason House looking at a breaking ball on the inside corner for the first out, then he picked off Basabe at first. Latz hit Chandler Seagle but got Luke Becker to fly out to right to end the threat. Spokane added to the lead in the third. Terry, the NWL home run leader with eight, reached on an error by the shortstop, went to second on a wild pitch and scored on Inoa’s double to the right-field corner to make it 4-0. Kuzia plunked Quiroz to put two on with two down, but Ricumstrict grounded out to end the inning. Latz had an easy time of it until the fifth. With one down, No. 9 hitter Becker drew a walk. Burgos followed with a line-drive homer to left to draw Tri-City (9-11) within two. Reinaldo Ilarraza dropped a perfect bunt for a single, but Latz retired Little for the first time of the night on a flyout and struck out Luis Asuncion – looking – to keep it a two-run game. The Indians went about getting those runs back. Terry led off with a single and Gardner ripped one to left-center to put runners at the corners with no outs. O’Banion’s fly to the track in left brought home Terry to push the Indians’ lead to 5-2. Depreta-Johnson made a gold-glove caliber play in the seventh, diving to his left to make a stop, jumping to his feet and making a good throw to rob Becker of a base hit. David Lebron provided three no-hit innings of relief with four strikeouts and Emmanuel Clase retired the side in order for the save, firing a 99.5-mph heater to record his second strikeout and third out of the ninth. Published: July 4, 2018, 9:25 p.m. Updated: July 4, 2018, 10:08 p.m.